On Saturday 13th of July, 2013, we went to the Avalon Recreation centre in Old Barrenjoey Road to have a look at some of the works displayed this year by members of the Art Group of Avalon Active Seniors. Besides meeting a new member we also caught up with some whom we met last year and could clearly see a progression in their works. Some had decided to work in acrylics where last year they had created predominantly in watercolours, while others had moved into new subject matter from cherished pets to landscapes. The ladies present were a sheer delight to talk to and related how they hung their works on the Friday night and enjoyed all the aspects, some exhausting, that go into curating, mounting and opening an exhibition. What do you have in the exhibition this year Joanne? A male and female portrait and a surfing painting. What do you like painting? What is your favourite subject to paint? How long have you been coming to the Art Group classes? Can you see a progression in your skills? What is the best thing about coming to the classes with the Art Group? What do you have in the exhibition this year Shirley? I’ve got a few family ones, ones of places I’ve been and some of things that I like. How long have you been coming to the classes? Since it started, about eight years. Can you see your work progressing? What’s the best thing about coming to the classes for you? The comradeship with the others who attend. What is your favourite subject matter to paint? What do you have in the exhibition this year Margaret? I’ve got a painting of magnolias, a portrait, paintings of flowers and seascapes. I can see your work has progressed since last year Margaret..
Our companionship. We all get on wonderfully well and we all have a good sense of humour. What do you have in the exhibition this year Barbara? I’ve got some pots and a cheeky lady and some landscapes and a beachscape through a window. Why is she a cheeky lady? Well, it’s obvious; her cheeks are showing and she’s very pert. What’s the best thing about coming to the Art Group for you? The companionship and the fun, it’s really good fun, and it makes you paint. It gives you an incentive to do things. Do you think your skills have progressed in the last year? Well, I’ve gone over to acrylics now because I found watercolours so demanding. So now I’m trying those. This is my first attempt at working with those. It’s more the company and the fun and getting a chance to be creative I enjoy. What do you have in the exhibition this year Andree? I have those three there taken from photos; the little boy with the umbrella, I call that ‘Grandma’s Red Umbrella’. The other one is actually my son in law and my son’s daughter. He’s teaching her to fish. The other one is a combination of two photos that I took along the beach somewhere. So most of your works are derived from photographs you have taken? Yes, they are. I did an eight week portrait course with Stephanie Brown recently and I’d like to keep on trying that. Stephanie’s amazing. I’d like to do another eight week course but I thought I’d look at what I’d learnt, practice and then go back. So portraiture is your favourite subject at present? I do like it, yes, the photos. That little fellow with the umbrella is my grandson; I’ve got the mouth right but I can’t get the eyes right. If you get the eyes right you’re doing pretty well. What’s your favourite thing about being involved in the Avalon active Seniors Art Group? I like them, they’re nice. I came here last year to have a look at this and thought ‘I want to get into that’. I hadn’t painted for a long time. This is your first time with the AASG Art Exhibition then? It is exciting; putting it together yesterday was very good, I loved doing that. How long have you been coming to the AAS Art Group? About four or five years. Have you seen your work progress in that time? Some of it is stationary and some of it has. It depends on what I’m using; I work in acrylics and watercolours and they’re both totally different. I also do a bit of charcoal. What subject matter do you like working on? I prefer scenery in watercolours. I have done a lot of travelling in the West and have worked in the bush. Now I’m working in acrylics doing scenes. What’s the best thing about being part of this art Group? It keeps you going. You can’t stop; you look at your work and think ‘I’ve got to do this for Monday’; it doesn’t matter what you feel like on Sunday, you know you’ve got to do something by Monday. So it’s a good positive influence in your life? The Avalon Active Seniors Group was formed over eight years ago, and a small group of painters who had been struggling along in a private capacity, were invited to join. 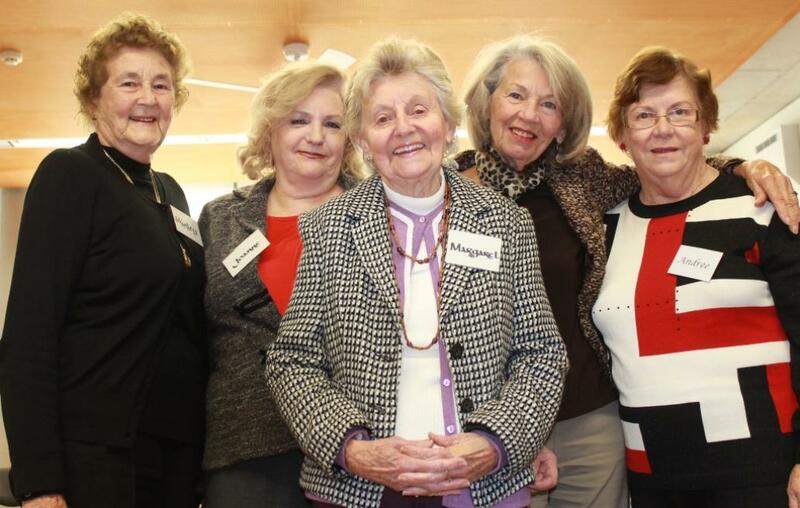 These seven ladies and one gentleman formed the nucleus of what is now the AASG Art Group. This wonderful mix of creative artists meeting at the Avalon Recreation Centre on Mondays are just one activity offered by Avalon Active Seniors Group. My Word – creative writing is offered on Thursdays, Soapbox – a discussion group on currents affairs is on offer on Wednesdays(bring your sense of humour), The Games Room with Mahjong and Scrabble on offer is available on Thursday afternoons and there is also a weekly Walking Group with trips in the local area. There is also talk of beginning a Bridge class should enough people express interest. Details of whom to contact for each activity are below. Joining Avalon Active costs a mere $10.00 for Annual Membership and a small fee for most activities. Please contact Joanne for details on 9913 7811. Left to right: Joanne, Margaret, Hon. 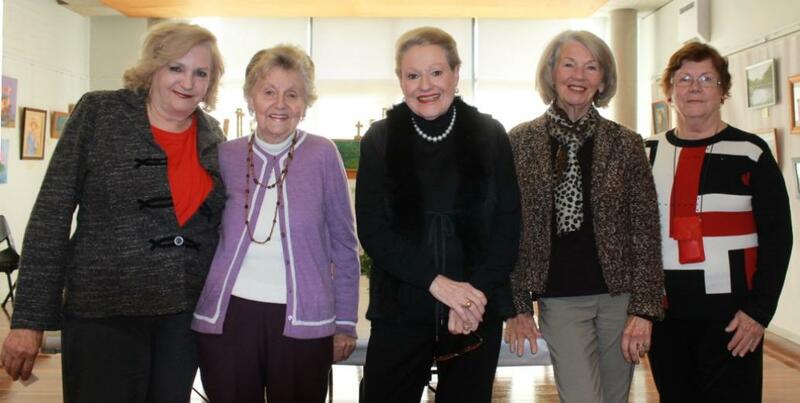 Bronwyn Bishop, Barbara T., Andree. Report and Photos by A J Guesdon, 2013.